Any student presently enrolled, or his/her siblings, will be guaranteed a placement for the following school year. A special pre-registration week is set aside in January for these enrollments. For new students, tours of the center, classroom visits, handbook distribution, curriculum review and school’s philosophy will be part of the registration process. Anytime throughout the school year, you may call and set up a tour, depending upon classroom availability. Either the Director or the Assistant Director will give you a tour of the center and provide you with the necessary information. Tuition is collected the first of each month and there is a 25% discounted amount for siblings if attending the same school year. Our students typically remain in the same level classroom from Sept – May. 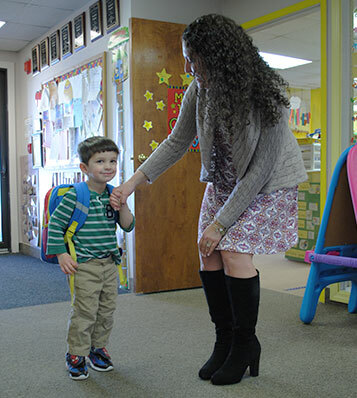 During the spring, our in-house students who will be promoted to the next level, are brought into their new classrooms by their present team to meet the new educator they will have in the fall. The Monday prior to the start of school in the fall, is a parent/student visit day to view cubbies, bathrooms, art area, etc.